Ten Palestinian were wounded, including 9 civilians, in the West Bank and Gaza Strip. Five of them were wounded in the West Bank and 5 others in the Gaza Strip. Israeli warplanes targeted two military sites in the northern Gaza Strip. Israeli forces conducted 64 incursions into Palestinian communities in the West Bank and a limited one in the Gaza Strip. 106 civilians, including 21 children and 4 women, were arrested. A house was demolished in al-Mukaber Mount village, south of the city in addition to an under-construction room in Beit Hanina, north of the city. Israeli forces issued 14 demolition notices against facilities, including a private school, in Silwad village, east of Ramallah. Dozens of settlers attacked Palestinian houses in Jaber neighbourhood in Hebron. Israeli navy forces opened fire 6 times at fishing boats in the northern Gaza Strip. Neither casualties nor material damage were reported. Three Palestinian civilians were arrested at the military checkpoints in the West Bank. Israeli violations of international law and international humanitarian law in the oPt continued during the reporting period (03 -09 August 2017). During the reporting period, Israeli forces wounded 10 Palestinian civilians, including 9 civilians in the West Bank and Gaza Strip. Five of them were in the West Bank while the 5 others were wounded in the Gaza Strip. Meanwhile, Israeli forces in the Gaza Strip continued to chase the Palestinian fishermen in the sea. Israeli warplanes carried out airstrikes against military training sites belonging to the Palestinian armed groups. In the West Bank, on 28 July 2017, Israeli forces wounded 5 Palestinian civilians. Three of them were hit with metal bullets during Kafr Qaddoum weekly demonstration, northeast of Qalqilya, in protest against the closure of the eastern entrance to the village with an iron gate. The 2 others were hit with bullets when the Israeli forces raided Dheisheh refugee camp, south of Bethlehem, to arrest them. In the Gaza Strip, border areas witnessed protests against the continued and unjust closures imposed on the Gaza population. The Israeli forces used force against the participants. Due to the shooting used to disperse the protestors, 4 Palestinian civilians were wounded; 2 of them with live bullets while the other 2 with tear gas canisters and sound bombs that directly hit them. In the context of airstrikes, on 09 august 2017, Israeli warplanes targeted in separate air strikes a military training site and checkpoint belonging to Al-Qassam Brigades (the military wing of Hamas Movement) in the northern Gaza Strip. The first airstrike resulted in the injury of a Member of Palestinian armed groups with shrapnel to the head. The 2 airstrikes caused damage to the site and checkpoint. Concerning attacks on fishermen, on 04 August 2017, Israeli gunboats sporadically opened fire at the Palestinian fishermen, northwest of Beit Lahia village, north of the Gaza Strip, and chased them. Similar attacks recurred against the Palestinian fishing boats in the same area on 05, 07 and 08 August 2017. During the reporting period, Israeli forces conducted at least 64 military incursions into Palestinian communities in the West Bank, and 710 ones in Jerusalem. During these incursions, Israeli forces arrested at least 106 Palestinian civilians, including 21 children and 4 women. Thirty-six of them, including 8 children and a woman, were arrested in occupied Jerusalem and its suburbs. In the Gaza Strip, on 03 August 2017, Israeli forces moved into east of Khuza’ah village, northeast of Khan Younis. They levelled lands along the border fence between the Gaza Strip and Israel. In the context of house demolitions, on 08 August 2017, Israeli municipality bulldozers demolished a house belonging to Hamzah al-Shaloudi in al-Rabay’ah neighbourhood in al-Mukaber Mount village, south of occupied Jerusalem, under the pretext of no licensing. The wife of the house’s owner said that she lived with her husband and 2 children for 3 months in the 65-square-meter house. She added that the Israeli Municipality demolished the house without any prior warning. When the Municipality staff arrived to demolish the house, she called the lawyer who headed to the Municipality and managed to get a decision to delay the demolition. However, the bulldozers had already demolished the house. On 09 August 2017, Israeli municipality bulldozers demolished an under-construction room belonging to Siyam family in Beit Hanina neighbourhood, north of occupied Jerusalem, under the pretext of no licensing. The family said that the 45-square-meter room was built of wood as the family started building it 2 months ago. In the context of demolition notices and house demolitions, the Israeli authorities notified 14 residential, commercial and industrial facilities in Silwad village, east of Ramallah, to be demolished under the pretext of no licensing although the facilities are located within Area B according to Oslo Accords. The Head of the municipality said that among those notified facilities is a private school located within Silwad Municipality. This school was built 10 years ago and is the only private school in the eastern Ramallah villages. Concerning settlers’ attacks against Palestinian civilians and their property, on 04 August 2017, dozens of settlers from “Karayat Arba'” settlement, east of Hebron, attacked Palestinian houses in Jaber neighbourhood to the east of al-Ibrahimi Mosque with stones. They also attacked Palestinian civilians under the protection of the Israeli police and forces, who did not lift a finger to prevent them. As a result, Tariq Rebi’ie Tamimi (40) was wounded to the left hand and sustained fracture in the palm of his hand. Moreover, Menwer Jaber (40) was wounded to the head and transferred to Hebron Governmental Hospital to receive medical treatment. At approximately 01:00, Israeli forces moved into al-Fawar refugee camp, southwest of Hebron. They raided and searched a house belonging to ‘Anan ‘Ali Zaquot (18) and then arrested him. Around the same time, Israeli forces moved into Bethlehem and stationed in al-Jabal Street in the center of the city. They raided and searched a house belonging to Mohammed Rebhi al-Rafati and then arrested him. Following that, the Israeli forces moved to al-Saf Street. They raided and searched a house belonging to Riyad Ibrahim Abu ‘Aahour (36). They handed him a summons to refer to the Israeli Intelligence Service in “Gush Etzion“, south of the city. At approximately 01:30, Israeli forces moved into Kuber village, north of Ramallah. They raided and searched a number of houses after which they arrested 2 civilians namely Qusai As’ad Fahel (19) and Nawras Mohammed al-Barguthi (19). At approximately 02:00, Israeli forces moved into ‘Ein Beit al-Maa’ refugee camp, west of Nablus. They raided and searched a house belonging to Nidal Mohammed Shattawi (26) and then arrested him. At approximately 02:45, Israeli forces moved into Qalqiliyah. They raided and searched a house belonging to Salem Abu Shehab as they were looking for his son Eyad (14). After the Israeli forces did not found him, they handed his parents a notice to turn him into “Kadomim” settlement, north of the city. Meanwhile, another Israeli force raided and searched a house belonging to Mohammed ‘Othman Ahmed Da’as (37) and then arrested him. At approximately 03:00, Israeli forces moved into Emrees village, south of Dura, southwest of Hebron. They raided and searched a house belonging to Saqer Mahmoud al-Sha’arawi (25) and then arrested him. At approximately 06:00, Israeli forces moved into al-Fare’ah refugee camp, south of Tubas. They raided and searched a house belonging to Yusuf Hasan Mahmoud Tayeh (30) and then arrested him. At approximately 07:30, Israeli forces accompanied with heavy military vehicles moved about 80 meters into the east of Khuza’ah village, northeast of Khan Yunis. They leveled and combed the lands along the border fence between the Gaza Strip and Israel. The incursion continued for several hours after which the Israeli forces redeployed along the abovementioned border fence. Note: During the aforementioned day, Israeli forces conducted (8) incursions in the following areas and no arrests were reported: Yatta, al-Samou’ and al-Thaheriyah villages; Kharsa and al-Surrah in Hebron; al-Ma’ajeen neighbourhood, northeast of Nablus; ‘Asker al-Jaeed refugee camp, northeast of the city and Rujeeb village, east of Hebron. At approximately 14:00, Israeli gunboats stationed offshore, northwest of Beit Lahia in the northern Gaza Strip, opened fire at and chased Palestinian fishing boats sailing within 2 nautical miles. As a result, the fishermen were forced to flee fearing for their lives, but neither casualties nor material damage were reported. At approximately 14:20, Israeli gunboats stationed offshore, northwest of Beit Lahia in the northern Gaza Strip, opened fire at and chased Palestinian fishing boats sailing within 3 nautical miles. As a result, the fishermen were forced to flee fearing for their lives, but neither casualties nor material damage were reported. Note: During the aforementioned day, Israeli forces conducted (4) incursions in the following areas and no arrests were reported: Beit Ummer, Sa’ir, Bani Na’im and Beit Marsam villages in Hebron. At approximately 01:00, Israeli forces moved into al-Jalazoun refugee camp, north of Ramallah. They raided and searched a number of houses after which they arrested 3 civilians namely Ibrahim Abu Kharmah, Mohammed Ramadan ‘Elyan and Karam Makhlouf Nakhlah. The Israeli forces claimed that they arrested the cell that opened fire yesterday at a military checkpoint at the entrance to “Beit Eil” settlement, north of Ramallah. They added that one of the arrested civilians handed over the weapon used in the attack. At approximately 02:00, Israeli forces moved into Beit Ummer village, north of Hebron. They raided and searched a house belonging to Ahmed ‘Ali Suleiman Abu ‘Ayash and then arrested his grandchild ‘Alaa’ Anwar al-Bal’awi (22) from al-Dheisheh refugee camp, west of Bethlehem. It should be noted that ‘Alaa’ was visiting his grandfather’s house when he was arrested. Around the same time, Israeli forces moved into al-Khader village, south of Bethlehem. They raided and searched a house belonging to Ahmed ‘Ali ‘Essa (19) and then arrested him. At approximately 03:00, Israeli forces move into Nahalin, southwest of Bethlehem. They raided and searched a house belonging to Mohammed Mousa Gayathah (25) and then arrested him. At approximately 13:30, Israeli forces moved into Qalqiliyah. They raided and searched a house belonging to Aminah ‘Ali Abtali (24), the wife of prisoner Adeeb al-Ghalban, who was arrested few weeks ago. They then arrested her and took her to an unknown destination. Note: During the aforementioned day, Israeli forces conducted (3) incursions in the following areas and no arrests were reported: Sebastia, northwest of Nablus; Dura and al-Shyoukh village in Hebron. At approximately 00:00, Israeli forces moved into al-Dawhah village, west of Bethlehem. They raided and searched a house belonging to Nader ‘Essa al-Khatib (28) and then handed him a summons to refer to the Israeli Intelligence Service in “Gush Eztion” settlement complex, south of the city. At approximately 02:00, Israeli forces moved into Taqou’ village, east of Bethlehem. They raided and searched a number of houses after which they arrested 4 children namely Marwan Kamal al-‘Amour (15), Mohyee Ahmed al-‘Amour (15), Moayad Abdullah al-‘Amour (15) and Ma’moun Ibrahim al-‘Amour (15). At approximately 02:30, Israeli forces moved into Kafel Hares village, north of Salfit. They raided and searched a number of houses and then arrested 2 civilians, including a child, namely Nour Abdul ‘Aziz al-As’aad (20) and Mohammed Abdullah Husni Shaqour (17). At approximately 03:00, Israeli forces moved into Sa’ir village, east of Hebron. They raided and searched a house belonging to Baraa’ Mousa al-Kawaziyah (22) and then arrested him. At approximately 14:20, Israeli gunboats stationed offshore, northwest of Beit Lahia in the northern Gaza Strip, opened fire at and chased Palestinian fishing boats sailing within 3 nautical miles. As a result, the fishermen were forced to flee fearing for their lives, but neither casualties nor material damage were reported. The shooting recurred at approximately 16:20 and 22:20 on the same day and in the same area. Note: During the aforementioned day, Israeli forces conducted (3) incursions in the following areas and no arrests were reported: al-Shyoukh and al-Majd villages in Hebron, and Howarah village, south of Nablus. At approximately 01:45, Israeli forces moved into Qalqiliyah. They raided and searched a house belonging to Ibrahim Mohammed Mahmoud Balashmeh (27) and then arrested him. They also raided and searched a house belonging to Muhsen Mahmoud Shraim (53) and handed him a summons to refer to the Israeli Intelligence Service. No more incidents were reported. At approximately 02:00, Israeli forces moved into Maithaloun village, southeast of Jenin. They raided and searched a house belonging to Mohammed Na’im Rabay’ah and then arrested him. Around the same time, Israeli forces moved into Kafer Raa’i village, southwest of Jenin. They raided and searched a house belonging to Shadi Nasser Sawalheh and then arrested him. At approximately 02:15, Israeli forces moved into Nablus. They raided and searched several houses after which they arrested Thaer Mohammed al-Aghbar (26) and Abdul Rahim Mohammed Radi al-Hanbali (77). Around the same time, Israeli forces moved into Howarah village, south of Nablus. They raided and searched several houses and then arrested Mohammed Ghassan ‘Oudah (20). At approximately 03:00, Israeli forces moved into Jenin refugee camp, west of Jenin. They raided and searched several houses after which they arrested 7 civilians, including 3 brothers namely Anwar, his brothers Amir and Ahmed Mohammed Yusuf Salamah; Qais al-Ghoul, Qusai al-‘Orsan, ‘Alaa’ al-Fayed and Hamoudah Frehat. Around the same time, Israeli forces moved into Qablan village, southeast of Nablus. They raided and searched a number of houses, arrested 6 civilians, took them to al-Amir Hall and questioned them on the spot. The arrested civilians were identified as Jehad Saleh Nashatah, Saleh Netham, Mahmoud Qasem Joudah, ‘Obadah Mahmoud, Walid Yusuf Zeyadah and Ahmed Sultan Aqraa’. At approximately 03:40, Israeli gunboats stationed offshore, northwest of Beit Lahia in the northern Gaza Strip, opened fire at ad chased Palestinian fishing boats sailing within 3 nautical miles. As a result, the fishermen were forced to flee fearing for their lives, but neither casualties nor material damage were reported. At approximately 11:00, Israeli forces moved into the southern area in Hebron, and stationed in front of Hebron Governorate’s Inspection Building, which is a security department established by the governorate to follow up the public life in the area that is not under the Palestinian security control. The building was searched and its contents were confiscated. The Israeli forces also arrested 4 employees namely Rabah Abu Suneinah, Mohammed Ghazi Abu Suneinah , ‘Aziz Abu ‘Afifah and ‘Obaidah Abu Suneinah. Note: During the aforementioned day, Israeli forces conducted (3) incursions in the following areas and no arrests were reported: al-Koum and Ethna villages in Hebron and Beta village, southeast of Nablus. At approximately 01:00, Israeli forces moved into Kuber village, northwest of Ramallah. They raided and searched several houses and then arrested Abdul Jalil al-‘Abed, attacker of “Halmish” attack, and his uncle Ibrahim al-‘Abed. Around the same time, Israeli forces moved into Madama village, south of Nablus. They raided and searched a house belonging to Mohammed Wajih Qut (28) and then arrested him. Around the same time, Israeli forces moved into Sebastia village, northwest of Nablus. They raided and searched a house belonging to Qatibah Abdul Karim ‘Azem (26) and then arrested him. At approximately 01:15, Israeli warplanes fired 4 missiles at a military site of al-Qassam Brigades (the Armed Wing of Hamas Movement). The site is located to the southwest of Jabalia village in the northern Gaza Strip. As a result, a member of a Palestinian armed group sustained a shrapnel wound to the head. He was transferred to al-Shifa Hospital in Gaza to receive medical treatment. Dr. Ayman al-Sahbani, Director of Emergency Department in al-Shifa Hospital, classified his injury as moderate. The shelling also resulted in a serious material damage in the site and left huge crater in it. Moreover, The airstrikes caused strong explosions that rocked large areas in the north of Gaza city and in Gaza city too, so civilians, especially women and children, were terrified. At approximately 01:30, Israeli forces moved into Taqou’ village, east of Bethlehem. They raided and searched dozens of houses after which they arrested 5 civilians, including 4 children, namely Theeb Mahmoud al-‘Amour (43), his son Mahmoud (15), Nezar Khalil al-‘Amour (16), Mahmoud Zeyad al-‘Amour (15) and Amir Wahid al-‘Amour (15). Around the same time, Israeli forces moved into Farsh al-Hawa area, west of Hebron. They raided and searched a house belonging to Badran Bader Jaber (70) Leader at the Popular Front for the Liberation of Palestine (PLFP) in Hebron. They then arrested him. 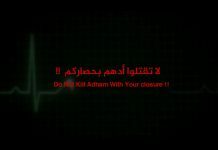 At approximately 01:35, Israeli warplanes fired a missile at a military checkpoint of al-Qassam Brigades (the Armed Wing of Hamas Movement). The checkpoint is located in the northeast of Um al-Nasser village in the northern Gaza Strip and about 250 meters to the west of the border fence between the Gaza Strip and Israel. The shelling resulted in serious material damage in the checkpoint, but no casualties were reported. At approximately 02:00, Israeli forces moved into Tulkarm refugee camp. They raided and searched several houses after which they arrested 2 civilians namely Ahmed Mohammed Bashir al-Jyousi (26) and Baker Mohammed Saleem Kharbush (27). Around the same time, Israeli forces moved into Ektaba Suburb in Tulkarm. They raided and searched a house belonging to Ashraf Abdul Hafeth Khaled Thaher (26) and then arrested him. Around the same time, Israeli forces moved into Yatta, south of Hebron. They raided and searched a house belonging to Ibrahim Mousa Makhamrah (37) and then arrested him. At approximately 02:30, Israeli forces moved into Ya’bud village, southwest of Jenin. They raided and searched a house belonging to Mohammed ‘Adnan Shukri Abu Baker (26) and then arrested him. They also raided and searched “Masaia” Library and confiscated fireworks. Around the same time, Israeli forces moved into Sa’ir village, north of Hebron. They raided and searched a house belonging to Eslam Ahmed Shalaldah (23) and then arrested him. Around the same time, Israeli forces moved into Sa’ir village, east of Hebron. They raided and searched a house belonging to Yusuf Hamdan Halaiqah (40) and then arrested him. At approximately 03:30, Israeli forces move into al-Mughir Valley, south of Hebron. They raided and searched a house belonging to Amjad Ahmed Fathallah Salhab (21) and then arrested him. At approximately 04:00, Israeli forces moved into al-Dheisheh refugee camp, south of Bethlehem. They raided and searched a house belonging to Sa’ad Ibrahim al-Salhi in order to arrest his son Ra’ed (22). When the soldiers raided the house, Ra’ed immediately left the house via a balcony and jumped over the fence surrounding their house. The soldiers opened fire at him and wounded him to the back, so he fell on the ground. Ra’ed’s brother Bassam rushed to help him, but the soldiers opened fire at him. However, he was able to reach his brother and carried him to a yard of a house that was near the camp entrance. After that, the soldiers headed to the house where Bassam and Ra’ed were present. They moved Bassam away and took Ra’ed out of the house. The soldiers left him on the ground for 20 minutes without offering him first aid. They later took him to a military vehicle and moved him to an unknown destination. Meanwhile, another Israeli force opened fire at Abdul ‘Aziz Ahmed ‘Arafah (22) from the abovementioned camp after he attempted to run away from his house for the soldiers attempted to arrest him. When he left the house towards the street, a soldier opened fire at him. Abdul ‘Aziz was wounded to the feet and then arrested. Later, the Israeli forces withdrew from the camp taking the arrested civilians to an unknown destination. Note: During the aforementioned day, Israeli forces conducted (3) incursions in the following areas and no arrests were reported: Dura and al-Hadab villages in Hebron, an Zabuba village in Jenin. Following Friday prayers on 04 August 2017, dozens of Palestinian civilians from Dura organized a protest and made their way to Muthalath Kharsa area, south of the city, southwest of Hebron, in rejection to the Israeli policy of confiscating a 500-square-meter land belonging to al-Shahatit family as the soldiers transferred it to a military watchtower. The land is located in area (A) that is under the Palestinian control according to 1993 Oslo Accords near the bypass road (60) and “Negohot” settlement. At the end of the prayer, the protestors raised the Palestinian flags and chanted national slogans condemning the Israeli policy of confiscating lands. Large Israeli forces patrolled the area and fired sound bombs and tear gas canisters at the protestors. As a result, many civilians sustained tear gas inhalation. A number of young men threw stones and empty bottles at the soldiers and set fire to tires. Meanwhile, a wastewater pumping vehicle arrived to the area and sprayed the main road and shops with wastewater. Clashes continued until the evening hours, but neither injuries nor arrests were reported. At approximately 13:45 on Friday afternoon, Palestinian civilians and International activists organized a protest in the center of Kufor Qaddoum village, northeast of Qalqiliyah. They made their way to the eastern entrance to the village in protest against closing that entrance since the beginning of al-Aqsa Intifada with an iron gate. When the protesters approached the entrance, the Israeli forces fired metal bullets, tear gas canisters and sound bombs at them. As a result, a 36-year-old civilian sustained a metal bullet wound to the Back. At approximately 13:45 on Saturday afternoon, 05 August 2017, Palestinian civilians and international activists organized a protest in the center of Kufor Qaddoum village, northeast of Qalqiliyah. They made their way to the eastern entrance to the village in protest against closing that entrance since the beginning of al-Aqsa Intifada with an iron gate. When the protesters approached the entrance, the Israeli forces fired metal bullets, tear gas canisters and sound bombs at them. As a result, a 26-year-old civilian sustained a metal bullet wound to the right hand and a 39-year-old civilian sustained a metal bullet wound to the back. At approximately 16:00 on Friday, 04 August 2017, dozens of Palestinian civilians gathered few meters away from the border fence between the Gaza Strip and Israel, east of Jabalia in the northern Gaza Strip, in response to calls for protests in the border area against the Israeli measures in occupied Jerusalem. A number of the young men set fire to tires and threw stones at the Israeli forces stationed along the abovementioned border fence. The soldiers fired live bullets, tear gas canisters and rubber-coated metal bullets at them. The clashes continued until approximately 20:00 on the same day. As a result, 4 civilians were wounded. Two civilians sustained live bullet wounds while the 2 others were hit with tear gas canisters. On Wednesday, 26 July 2017, Israeli forces allowed the exportation of 23.3 tons of tomatoes; 3.2 tons of eggplants; 6.4 tons of sweet peppers; 31.9 tons of cucumbers; 14.9 tons sweet potatoes; 12 tons of clothes and 450 piece of animals’ skin. On Thursday, 27 July 2017, Israeli forces allowed the exportation of 2 tons of sweet peppers; 3.2 tons of sweet potatoes; 0.6 tons of fish; 14.7 tons of cucumbers; 8 tons of clothes; 1.4 tons of peppers and 2 tons of eggplants. On Sunday, 30 July 2017, Israeli forces allowed the exportation of 8.9 tons of cucumbers; 12 tons of furniture and 2.56 tons of squash. On Tuesday, 18 July 2017, Israeli authorities allowed 2 international workers to renew their permit. On Thursday, 03 August 2017, Israeli authorities allowed 2 international worker to renew his permit and a person to return to the West Bank. On Thursday,03 August 2017, Israeli forces established 2 checkpoints at the southern entrance to Dura village and at the entrance to Beit ‘Awaa village. On Saturday, 05 August 2017, Israeli forces established 4 checkpoints at the eastern entrance to Dura village, at the entrances to Raboud and Samou’a villages and at the entrance to al-‘Aroub refugee camp. On Sunday, 06 August 2017, 4 similar checkpoints were established at the entrance to al-‘Aroub refugee camp, at the northern entrance to Halhoul village, at the entrance to al-Burj village and at the western entrance to Yatta village. On Monday, 07 August 2017, Israeli forces established 4 checkpoints at the entrance to al-Fawar refugee camp, at the entrances to Sa’ir and Samou’a villages and at the southern entrance to Hebron. On Tuesday, 08 August 2017, 2 similar checkpoints were established at the entrance to al-Fawar refugee camp and at the entrance to Ethna village. On Thursday, 03 August 2017, Israeli forces established 3 checkpoints under the bridge of ‘Azoun village, on the main street between Qalqiliyia and Tulkarm, at the eastern entrance to Qalqiliyia, and at the entrance to ‘Azoun village, east of the city. On Saturday, 05 August 2017, Israeli forces established 3 checkpoints at the eastern entrance to Qalqiliyia, and at the entrance to ‘Azoun village, east of the city ( was established twice). At approximately 22:10 on Sunday, 06 August 2017, a similar checkpoint was established at the entrance to ‘Azoun ‘Itmah village, southeast of the city. On Monday, 07 August 2017, Israeli forces established 2 checkpoints at the entrance to ‘Azoun village, east of Qalqilyia and in the center of al-Nabi Iyyas village, on the main street, east of the city as well. At approximately 11:40 on Thursday, 03 August 2017, Israeli forces established a checkpoint at the northern entrance to Salfit. On Friday, 04 August 2017, Israeli forces established 2 checkpoints at the northern entrance to Salfit and under the bridge of Askaka village, east of the city. On Saturday, 05 August 2017, Israeli forces established a checkpoint between Salfit and Burqeen villages, west of the city. A similar checkpoint was established between Kaful Hares and Hares villages, north of the city. At approximately 08:45 on Sunday, 06 August 2017, Israeli forces established a checkpoint at the entrance to Deir Balout village, west of Salfit. At approximately 10:55, a similar checkpoint was established at the northern entrance to the city. At approximately 12:10 on Sunday, 06 August 2017, Israeli forces stationed at Za’tara checkpoint, south of Nablus, arrested Jawhar Jameel Suliman al-Deek (35), from Kafur al-Deek village, west of Salfit, after checking his ID card. At approximately 10:00 on Monday, 07 August 2017, Israeli forces stationed at al-Karama crossing, arrested Sa’d Khalid Riyad Haj Mohamed (22), from Beit Dajan village, east of Nablus. Sa’d was arrested while travelling to Jordan through the crossing. At approximately 21:00 on Thursday, 03 August 2017, Israeli forces moved into Maragha neighborhood in Silwan village, south of occupied Jerusalem’s Old City. They raided and searched houses from which they arrested Yousef Maher al-Rajbi (19) and Mohamed Fayiz al-Rajbi (15). At approximately 23:00 on Thursday, Israeli forces moved into occupied East Jerusalem’s Old City. They raided and searched houses from which they arrested 3 civilians, including 2 children. The arrested persons were identified as Abdullah Abu ‘Asab (11), Ahmed Naser Dayiah (11) and Yousef al-Za’tari. Following the Friday prayer, on 04 August 2017, Israeli forces deployed at al-Aqsa Mosque Gates in occupied East Jerusalem’s Old City arrested 9 Palestinian civilians while they were on their way out from al-Aqsa Mosque. The Israeli forces stopped the civilians, checked their IDs and then searched them. In the meantime, the arrested persons were taken from al-Asbat (Lion’s Gate) to al-Rahama Gate Cemetery, where there was an investigation center. According to Lawyer Mohamed Mahmoud, the arrested persons were identified as photojournalist Mohamed al-Fateh Abu Isneinah; Mohamed al-Taweel; Mohamed al-Baby; ‘Obaidah al-Taweel; Nour al-Herbawi; Hassan Abu Lail; Samer Tawfiq Shaniq; Rayan Hamed and Basil Jaber. At approximately 02:00 on Saturday, 05 August 2017, Israeli forces moved into Qalandia refugee camp, north of occupied East Jerusalem. They raided and searched a house belonging to Saleem Abu Kowaik and arrested him. At approximately 01:00 on Sunday, 06 August 2017, Israeli forces moved into Silwan village, south of occupied Jerusalem’s Old City. They raided and searched a house belonging to Basil Dowaik (19) and arrested him. On Sunday, 06 August 2017, Israeli forces arrested 9 Palestinian civilians after beating them up at al-Silsilah and al-Majles Gates of al-Aqsa Mosque in occupied East Jerusalem’s Old City. The Palestinian civilians were arrested in concurrent with an activity organized for children in al-Aqsa Mosque yards. Eyewitnesses stated that the Israeli forces beat up and pushed Palestinian worshipers while entering al-Majles and al-Silsilah Gates. They also raided nearby houses from which they arrested Mayada Shawamrah and 6 other civilians. The arrested persons were identified as ‘Alaa al-Haddad, Mo’ayad Idreis, Mo’az Idreis, Ahmed Idris, Abdullah Badran and ‘Atif Badran. At al-Silsilah Gate, the Israeli forces pepper-sprayed al-Aqsa Mosque guards and worshipers after beating them up. They also detained al-Aqsa Mosque guard, ‘Imran al-Rajbi, in the detention center for few minutes before he was released. Before al-Maghrib prayer, the Israeli forces arrested Tareq Ziyad Abu Mayalah at al-Majles Gate while attempting to enter al-Aqsa Mosque. At approximately 02:30 on Monday, 07 August 2017, Israeli forces moved into al-Thawri neighborhood, south of occupied Jerusalem’s Old City. They raided and searched a house belonging to Amjad Hassonah (19) and arrested him. At approximately 03:30 on Monday, Israeli forces moved into Beir Ayoub neighborhood in Silwan village, south of occupied Jerusalem’s Old City. They raided and searched a house belonging to Adullah al-Qumairy and arrested his two sons Mohamed (22) and Rashid (20). At approximately 01:00 on Tuesday, 07 August 2017, Israeli forces moved into Wadi al-Jouz neighborhood, east of occupied Jerusalem’s Old City. They raided and searched houses from which they arrested Mofeed Ziyad ‘Imran Sa’idah (17) and Jihad Naser Sa’idah (18). At approximately 16:00, Israeli forces arrested and beat up Nour al-Deen Ishaq al-Rajabi (54) while he was near al-Asbat (Lion’s Gate), one of al-Aqsa Mosque’s Gates, in occupied Jerusalem’s Old City. At approximately 19:00 on Tuesday, Israeli forces moved into al-Thawri neighborhood, south of occupied Jerusalem. They raided and searched houses from which they arrested Omar Mohamed Showaki (14), Sameer Bakhtan (13) and Omar Bseilah (14). At approximately 00:30 on Tuesday, 08 August 2017, Israeli forces moved into Wadi al-Jouz neighborhood in occupied East Jerusalem. They raided and searched a house belonging to ‘Adli Khalil al-Salaimah (34) and arrested him. At approximately 01:30 on Tuesday, Israeli forces moved into al-Mukaber Mount area, south of occupied Jerusalem. They raided and searched a house belonging to Mustafa Mohamed Abu Jamal (14) and arrested him. At approximately 07:00 on Tuesday, 08 August 2017, Israeli Municipality bulldozers demolished a house belonging to Hamza al-Shalodiy in al-Rabaiy’ah neighborhood in al-Mukaber Mount village, south of occupied Jerusalem, under the pretext of non-licensing. Hamza said that large number of Israeli Special Forces accompanied with sniffer dogs, Israeli Municipality crews and bulldozers moved into al-Rabaiy’ah neighborhood. He added that the Israeli Special Forces raided his house, forced his family to leave the house, took some its contents out and then demolished it. Sanna’ Halsah al-Shalodiy, Hamza’s wife, said that she lives with her husband and their 2 children in their house for 3 months. It should be noted that the house was built on an area of 65 square meters. She stated that the Israeli Municipality demolished the house without any prior warning. Sanaa’ added that when the bulldozers came to demolish the house, she called the lawyer who then headed to the municipality and managed to get a decision to delay the demolition, but the bulldozers had already demolished her house. Moreover, she said that the Israeli Municipality crews, who were surrounding the house, refused to delay the demolition until the lawyer came with the decision to delay the demolition. When the Israeli court decided to delay the demolition, the bulldozers had already demolished most of the house except for parts of a room. At approximately 09:00 on Wednesday, 09 August 2017, Israeli municipality bulldozers demolished an under-construction residential room belonging to Siyam family in Beit Haninah neighborhood, north of occupied East Jerusalem, under the pretext of non-licensing. 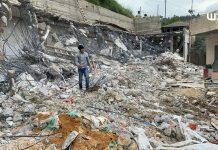 Siyam family stated that the Israeli municipality bulldozers accompanied with Israeli forces surrounded the house and demolished it. They also demolished the fence surrounding the land on which the room is established. The family said that the 45-square-meter residential room was built of wood 2 months ago.